Sean at Blogos is sharing his work on a Bible Knowledgebase he’s creating. He recently wrote about how to prioritize people in the Bible for the project. The method he discusses combines the number of times people are mentioned with the number of books they’re mentioned in. I propose a different method—it’s not better or worse, just different. The idea is, first, to rank occurrences by chapter popularity: weighting an occurrence in John higher than an occurrence in Zephaniah, for example. (I don’t have anything against Zephaniah, but people don’t read it as often as John.) Second, I want to rank people associated with certain prominent people more highly. 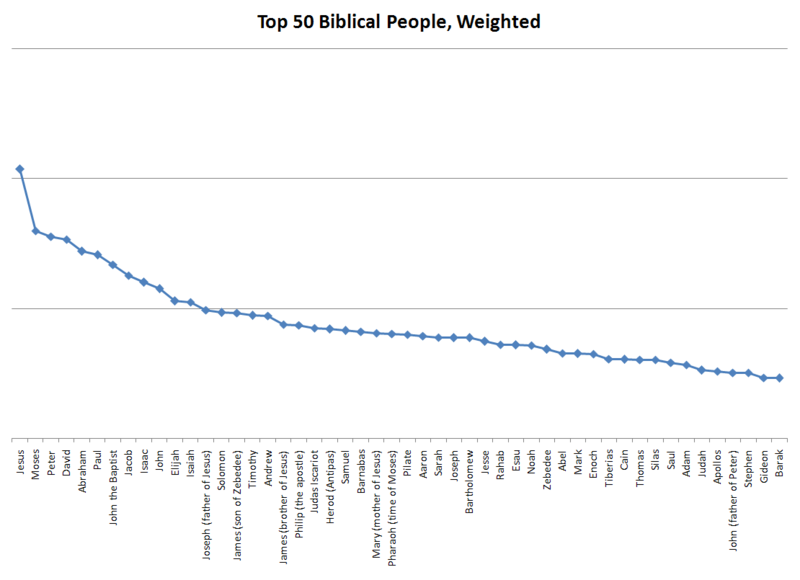 The ESV blog published a list of the most popular verses in the Bible. They also share their figures on how often people look at each chapter. I used this data as the basis for the popularity figure. I then subjectively picked twelve of the most prominent people in the Bible (in my opinion): Abraham, Jacob, Joseph, Moses, Samuel, Saul, David, Solomon, Elijah, Jesus, Peter, and Paul. Names that appear in the same chapter with these people got extra weight. Then it was just a matter of going through all the names and weighting them based on the chapters they appeared in. I didn’t have access to Sean’s person-disambiguation data, so I needed to make some approximations, but the general trend holds. I can’t honestly say that either of these lists is superior overall. I like parts of my list better than Sean’s and parts of his better than mine. Here’s the raw data (Excel 2007 file) if you want to look at it in more detail. Download a KML for Google Earth containing map overlays for Jerusalem, both ancient and modern. Don’t forget to adjust the transparency of the maps and turn on the Google Earth terrain layer to get a strong sense of the topography. Twelve maps are there now—six of ancient Jerusalem and six of modern Jerusalem. They’re of varying accuracy, especially the ones of ancient Jerusalem. All the maps come from the David Rumsey Historical Map Collection, an amazing website with thousands of maps, all available under a Creative Commons license, though a slightly different flavor from the one on the rest of this site. Please observe the licensing restrictions for the map images. More overlays may be on the way from other sources depending on whether I can get permission from the copyright holders to use them. I have to say that I’m a big fan of Creative Commons. I first heard about David Rumsey from O’Reilly Radar. My brother points me to GoogleLitTrips.com, a site with a similar mission to this one, except they map the places in classic works of literature instead of the Bible. They’ve done six books so far. Click “9-12” in the banner at the top of the site to get to the list of books. (It took me awhile to figure it out.) Why couldn’t we have had Google Earth when I was an English major? Commenter Josh asks for full-Bible KMZs with books as subfolders. Well, Josh, you clearly like to toggle things, and I’m only too happy to feed your habit. Download a KMZ arranged by book or by chapter. Click the checkbox next to each book you want to look at—any number of books is fine, though you’ll start getting duplicates if you look at more than one book at a time. In other words, there will be two Jerusalems if you look at both Matthew and Mark. The chapter KMZ is arranged by book, then by chapter. All the places in the Bible in one place, arranged alphabetically, with thumbnails and links to all their occurrences. In response to an earlier post, David asks the good question of how to add the files to Google Earth. It’s actually pretty easy. 1. 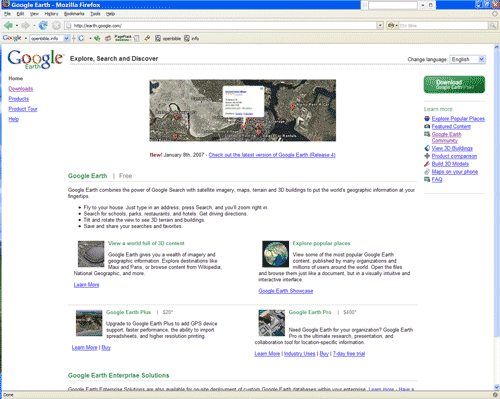 Download Google Earth if you don’t already have it installed. It’s free, and it’s useful for all sorts of things if you (or your kids) like maps at all. 2. Go to the Geocoding page and click the KML or KMZ file you want. I’ll assume you want the file with all the places in the Bible. 4. Google Earth opens. 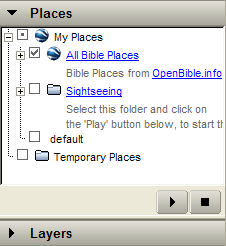 “All Bible Places” appears under the “Temporary Places” folder in the sidebar. 5.Now use Google Earth however you want to. When you’re done, close Google Earth to get the following prompt. 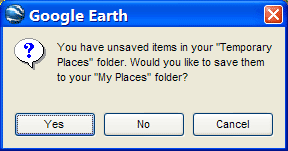 Click “Yes” if you want to save the places permanently to your computer. Now the places will appear whenever you start Google Earth. Check or uncheck the checkbox to make them appear or disappear. I hope that was clear enough. Leave a comment if you run into any problems. The ESV Blog linked to OpenBible.info today, sending lots of traffic. Buzzard Blog also linked, saying, “Um, this is amazing. 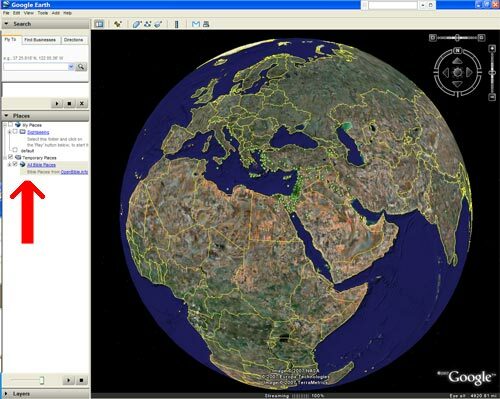 Some folks at OpenBible.info have used Google Earth to ‘geocode’ the Bible–to satellite map every book of the Bible, noting each location mentioned in Scripture.” Thanks! I really appreciate it. Solomon built the temple in Jerusalem, of course. And scholars dispute exactly where Jesus was walking on water. Luke mentions that it was near Bethsaida, but Mark says that the boat was going to Bethsaida. Some people have suggested that there were two Bethsaidas, while more recent thinking argues that “Bethsaida” also means “the area around Bethsaida.” I followed the latter thinking. In any case, John mentions that they ended up in Capernaum on the north side of the Sea of Galilee. Have you ever come across a place name while reading your Bible and wondered where it is? OpenBible.info has plotted the locations of every identifiable place mentioned in the Bible and coordinated the information with Google Earth to give you satellite images of Bible place names sorted by book and chapter. The process is called Bible Geocoding. This could be a helpful site to have open while reading or studying a particular book of the Bible to keep track of what place is where. That’s definitely one use for the site (thus all the pretty maps). I also hope that other people will take the raw data and build much cooler things with it than I’m capable of. Uber-blogger Justin Taylor also generously provided a link. Free in Truth reposted some of the ESV Blog’s post. I’m glad you found it interesting! It took about a month of work in my (apparently copious) spare time, from identifying the places to doing the programming for the maps, to create this site. Executable Preacher also links to BibleCharts.org, which looks like it has some useful info. Tired of looking at the maps on the back of your bible? Want something more interactive? The folks at OpenBible.info have “geocoded” all the places in the Bible, that is to say they’ve pinpointed the geographical location (longitude/lattitude) of every identifiable place mentioned in the Bible. My disappointment with the current state-of-the-art of Bible mapping was one of the impetuses behind the site. On the other hand, both BibleMap.org and BibleMapper.com do high-quality work. Robbro.com writes: “This is one I’ve been looking for… A Google Earth KMZ file for the Complete Bible, or broken down by Individual Books.” Glad to oblige. Because I Said So was nice enough to feed the site a link. Religione 2.0 says something in a language (Italian) I don’t speak, though my high-school French plus a Google translation makes me think that, at least, they’re not angry with me. Phil Gons writes: “I love being able to see the places about which I’m reading, and being able to zoom in and interact with them in a 3D environment beats a 2D map or image as far as I’m concerned, though being able to preview and link to these locations in Google Maps is still pretty cool.” Surprisingly, Google Maps gives a good approximation of the Google Earth experience. The only limitation I’ve run into is that it can’t show a big number of places at once, so larger books don’t show up in their entirety. Sunday School Thoughts says: “This is very cool. 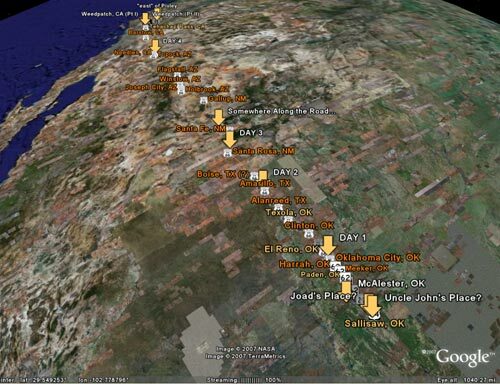 It is a google map of every location mentioned in the Bible. You can look at the locations of each city mentioned in each Book of the Bible. Just click the preview button next to a book and try it out. It is much more powerful than that, if you have Google Earth installed (I don’t).” Brett left the very first comment on this blog below. Power of Change writes: “Fun map clicking lies ahead…” Map clicking is strangely compelling. I’m not sure why that is. w2wkb’s Bog Splot provides a link, too. A recent post on the Inside Google Book Search blog plots the locations mentioned in books over time. 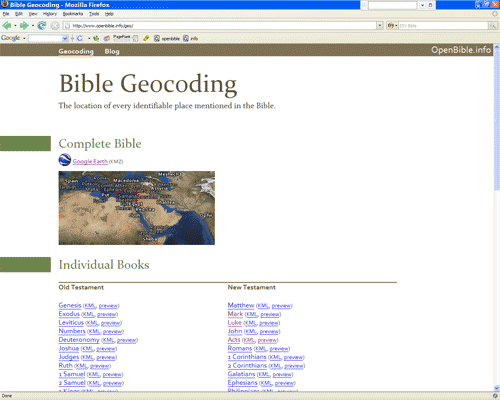 Let’s do the same thing with the Bible geocoding data. Bible book order corresponds (very) roughly to historical order, so I’ll use books as an approximation for historical periods. The bigger the dot, the more often the books mention the place. Here you can trace the patriarchs’ and the Israelites’ journeys to lots of places that aren’t the promised land. The conquest and early rule of Canaan. The rule of the kings and subsequent exile. These books cover a good period of time, much of it preoccupied with the exile. The gospels focus on the life of Jesus in Palestine. The church spreads beyond the Middle East. Here it’s all put together. Simple. It’s weird that no one’s ever collected basic biblical data—such as the locations of all the places in the Bible—into an accessible format. The goal of this site is to make this useful but uncollected data available for you to use and remix however you want. This blog will be occasionally updated. You are currently browsing the OpenBible.info Blog blog archives for March, 2007.